Today we put our muscles into our dinner! This dinner illustrates three things: one, how to feed a family of 3 on one little chicken breast; two, how delicious a non-rice pilaf can be, and three, how sometimes it’s too cold to go outside to fetch a salad. Thus, the pantry/freezer meal. Sounds good — and warming in the preparation and the consumption. MMM that sounds so good. I am trying to cut down on our meat consumption this year. Can you believe my family of 5 can put away 3 lbs of chicken at one sitting??? Hubby picked up 10 lbs of chicken yesterday..I had it sliced thin, and i am planning on separating it into TEN packs for TEN dinners! Love your blog! and if you’d like to join us, we’d love to have you! Sounds delicious : ) ! you get plenty and share with us : ) . Do you have heat in the hoop houses? yumm. I love these kinds of hearty winter meals. I like hot food in winter, am not much for salads right now. 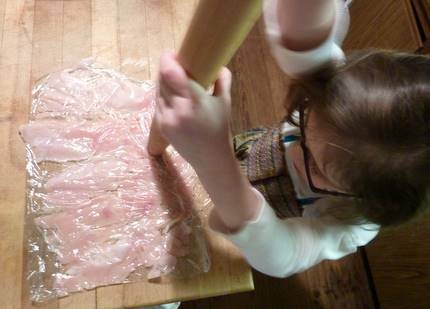 I have used a rolling pin for years to tenderize/make meat into cutlets also.It’s something my grandmother did and I picked it up from her. Good meal and good idea to stay warm! What are the blue Coco beans? Aimee: the sweet/sour gravy is what really makes it sing, I think; well, that, and the fact that it takes zero time to cook up. Stefani, what’s that expression about cutting wood, that it warms you twice? Yeah. Hello MK! I will definitely check it out; I am always keen on meeting more Michiganders. I love how you have embraced your inner kitchen goddess, yet still hate housework…can’t have it all, right? Hi WF! Ah, well, next long stop at home maybe you can do it. Or just wait, I guess. No heat in the greenhouses at all. It is chilly in there now because we’ve had a week or more of lots of snow and no sun, but the ground won’t freeze in there (just as well as I just pulled up a foot-long carrot yesterday). Hayden, yay, you’re listening to your body. I think that’s something of a lost art. Maybe you picked it up in CA! They’re so much more hep than we are, hah. But yeah, I still appreciate a crisp salad but there is something about potatoes with gravy at this time of year. John, AND it’s great for getting out a wee bit of frustration, or child energy. Glad to hear you’re still pounding away. They’re a purple pole bean, MC. They turn green when you cook them but they’re on the darker side of green beans. 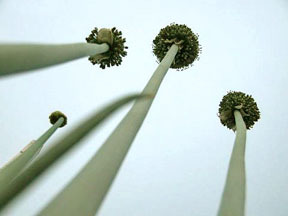 They’re prolific in my yard, like the heat, but can develop tough strings when they’re large. Just have to keep on top of them…but then again their shell beans are likewise pretty special!